, Wednesday, November 16, 2016 — Springfield, OH (November 11, 2016) – Gareth A. Selwood has been showing horses his whole life, and he recently competed at the annual International Friesian Show Horse Association (IFSHA) World Show. As a seasoned professional, Selwood is no stranger to the show ring, and no stranger to the winner’s circle. Garnering the Accuhorsemat Cup at the 2016 IFSHA World Show, held at the Champions Center Expo in Springfield, Ohio, was especially meaningful to the New York-based trainer. Preparing for and competing in horse shows can cause stresses for trainers, riders, and their equine partners. In recognition of this, the company Acuswede travels to top shows across the United States to reward those riders who keep calm under pressure and handle the competition with ease. Acuswede is the North American distributer of the innovative equine acupressure blanket, the Accuhorsemat. The Accuhorsemat reduces tension and soreness in horses, improving mobility, performance, and overall health through regular treatments. Acuswede presented the Accuhorsemat Cup to Selwood at the IFSHA World Show in recognition of his ability to keep calm while ensuring that his horses were also calm and happy throughout the competition. Selwood credits earning the Accuhorsemat Cup to his many years of experience at staying relaxed while wearing multiple ‘hats’ at the show. He competes many horses in riding, driving, and halter classes. Selwood has been successfully helping his horses handle intense show ring pressure since he was very young. “At 19 years old I can remember taking 18 halter horses to a show and showing all 18 in one day. It’s something I trained myself to do,” he said. “I have been very lucky in the show ring, and when you have been lucky, you tend to be able to do more. 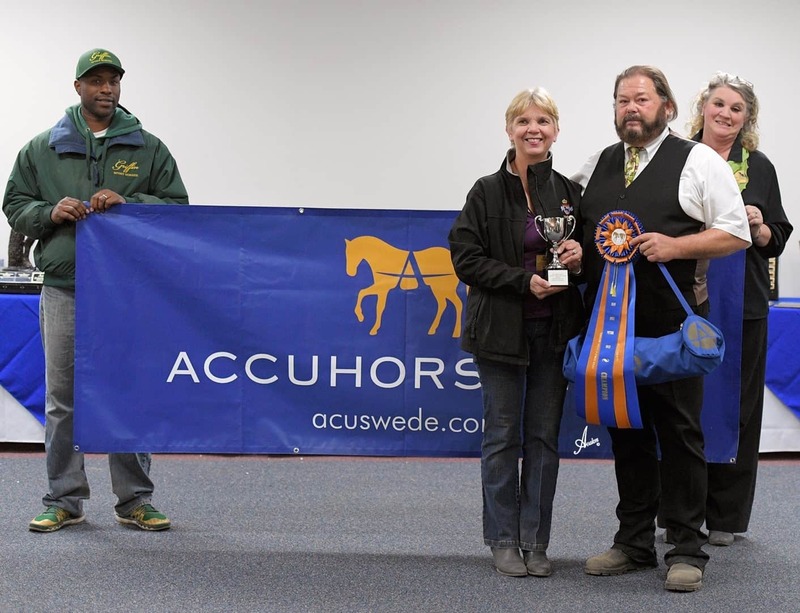 As winner of the Accuhorsemat Cup, Selwood received a beautiful trophy, a ribbon, and an Acuswedemat, which is a special tension-releasing acupressure mat designed specifically for people. Using the Acuswedemat, people can get the same benefits as horses get from the Accuhorsemat. The Accuhorsemat increases blood flow and actively assists horses in removing tension in connective tissue by stimulating key acupressure points, as has been demonstrated in a Thermography study. The Accuhorsemat can be used before riding to assist with warm-up, after riding to accelerate muscle recovery, and in between massage/chiropractor/acupuncture sessions to maintain mobility and overall health. Originally developed in Sweden, the blankets for performance horses – and now the mats for people, as well – are distributed in North America by Acuswede. The Acuswedemat takes acupressure to a whole new level, combining classic acupressure and Swedish innovation in a portable mat that applies pressure to multiple points in the body. Using the Acuswedemat regularly increases circulation and accelerates muscle recovery and healing. It activates the body’s natural endorphins to create an overall feeling of well-being. “I’m eager to try the Acuswedemat that I won, because when I am working all day the muscles in my back tend to cramp,” Selwood said. “I am hoping the Acuswedemat will help with that.” The Acuswedemat and Accuhorsemat can be used for relaxation, pain relief, and as part of a daily routine to improve performance activities. The products will relieve pain and tension, increase circulation, prevent soreness, and accelerate healing.